Edgar Allan Poe’s short story “The Cask of Amontillado” was first published in 1846. The story is often included in horror anthologies, and has also inspired several TV dramatizations. 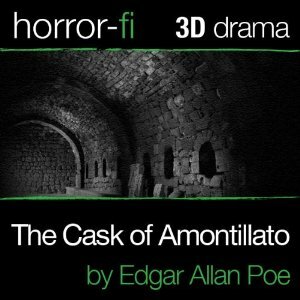 This audio dramatization was produced by The Wireless Theatre Company as part of their 3D Horror-fi series and, while it is not an audiobook in the true sense of the word, the recording is available to buy from some audiobook retailers. For those who are not already familiar with the tale, “The Cask of Amontillado” is set in an un-named Italian city and is the story of a man named Montresor who takes a cruel and gruesome revenge on his friend, Fortunato, who he feels has insulted him in some way—though the nature of this insult is never elaborated upon. Fortunato is a connoisseur of fine wines so Montresor lures him into the catacombs beneath the city under the pretence of taking him to a wine cellar so he can get his expert opinion on a rare cask of Amontillado Sherry. After first ushering him into a niche, where he chains his already intoxicated victim to a wall, Montresor then begins to wall up the entrance, interring him alive. “The Cask of Amontillado” is rather a nasty story and the voice actors Adam Cole and Andrew Ward do a wonderful job of bringing the tale to life and succeed in creating an audio experience that far surpasses any simple telling of the tale. I have read the story more than once, but never before have I been moved to feel so much sympathy towards the unfortunate Fortunato. The dramatization has a runtime of 23 minutes, it was recorded in binaural stereo, and the quality is so good it is spooky because the sound truly does seem to come from all around rather than from the headphones. It is also worth noting that the recording was made on location in some ancient vaults, a fact that is, I am sure, partly responsible for this being such an effective and hard-hitting dramatization.